Back in the spring, I found my perfect shampoo. L'Occitane has absolutely mastered the art of creating a good cleansing wash, that never strips the hair or skin. And I'm not the only one who's hooked - Joseph just asked for a refill of the Cedrat Shower Gel & Shampoo, also mentioned earlier this year. But let's face it, paying over $20 for an essential product can be too expensive for us budget-conscious folk, so I'm staying open-minded to the less-luxe alternatives. No offense to Pantene, but after trying their Sheer Volume line (first mentioned here) I almost swore off drugstore shampoos forever. 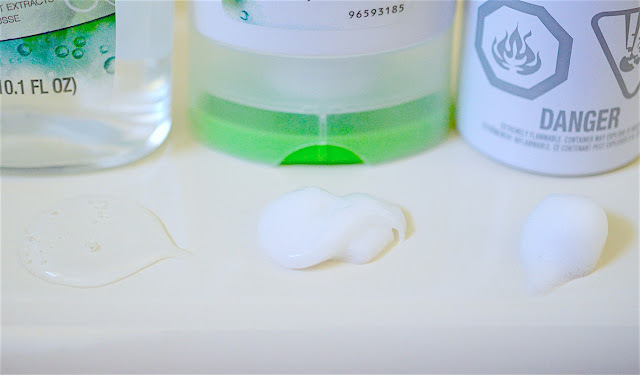 I don't know why, but both the shampoo and conditioner felt like liquid plastic. The shampoo foamed up way too much, and the conditioner coated my hair like nothing else. It wasn't volumizing, nor nourishing. My hair is healthy and fine, and luckily I have a lot of it. 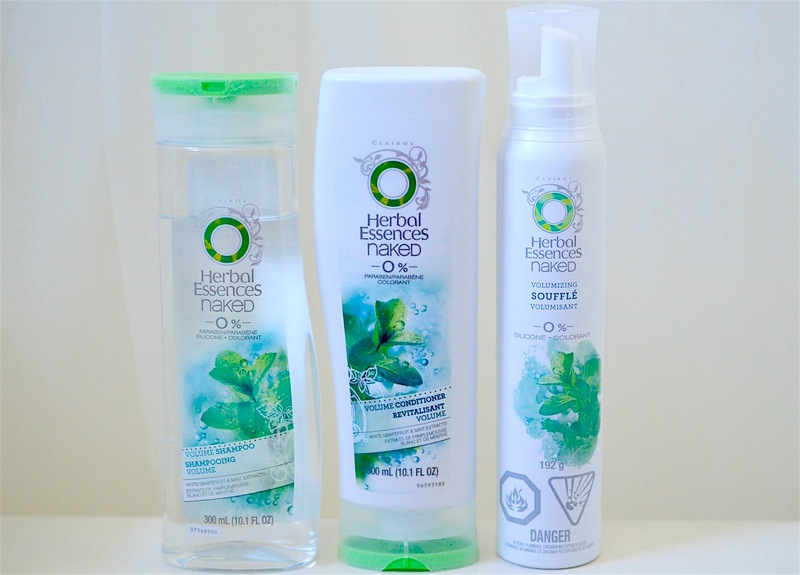 I love reviewing products on BzzAgent, so when I got the offer to sample three full-sized products from Herbal Essences for free, I decided to give them a go. I came in with no expectations for this line, and I am pleasantly surprised overall. The shampoo leaves my hair feeling so clean, but not stripped like other more clarifying shampoos. The grapefruit and mint scent is fresh, fruity and tangy - totally up my alley. For a product that's around $5, I'm sold. Much like my eternal love for the "worst" food (milk, bread, salami *shrieeeks! *) I couldn't care less about most "parabens" and "sulfates". That being said, no silicone or mineral oil will trick me into thinking that it works better at moisturizing than a good ol' plant oil. So the fact that this line omits added colouring and some silicones is a nice bonus. As for the Naked Volume Conditioner, I'm neutral. It doesn't bother me, but I probably wouldn't repurchase it. The texture is creamy and the product doesn't weigh down my limp, lifeless locks. I don't find it to be very nourishing, since there is no oil content. Dimethicone is pretty far down on the ingredient list and I don't feel like there's a coating on my hair once it's dry. For the affordable drugstore price, it's a nice addition to the range. Anyone with fine, flat hair must try this mousse. I hate that crunchy sticky feeling that most mousses leave behind, but this one isn't like that at all. I usually blow-dry my hair before bed, and this is the only post-shower product that I put in before doing so. When I wake up in the morning, my hair has workable texture that isn't too messy, flat or greasy. It's like a lighter-weight version of the Bumble and bumble Bb. Texture Hair (Un) Dressing Creme. Believe it or not, it even reduces frizz and makes my hair go smooth and straight. One small issue - I find that the dispenser is a little bit glitchy and sometimes takes a bit of added force to dispense the mousse. I'll deal with it for $5. 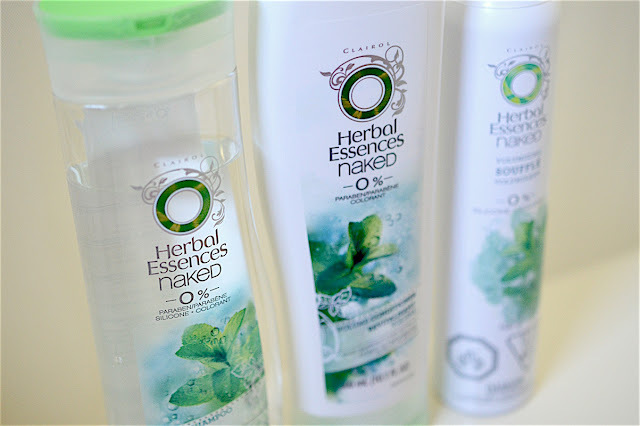 I'm so happy with this Herbal Essences line that I even bought the dry shampoo in a recent trip to shoppers. Not too sure if I like it too, but you'll see it if I do.